The time-honored cultural tradition of Aboriginal storytelling is depicted in a new series of coins from the Royal Canadian Mint. Available in platinum, gold and silver are coins with reverse designs emblematic of the Legend of Nanaboozhoo. 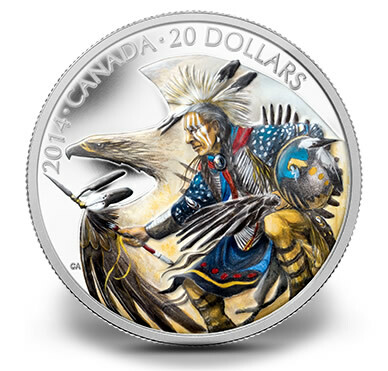 Cyril Assiniboine, a renowned self-taught Ojibwa artist, designed the images of Nanaboozhoo and the associated themes showcased on the coins. "Storytelling has long been a rich oral tradition for Aboriginal cultures," a description states on the Royal Canadian Mint website. "It is said that from the first snowfall to the first clap of thunder, elders impart history, traditions and life lessons to the younger generation through rich narratives filled with allegories and imagery." "For the Anishinaabe, an important cultural character is Nanaboozhoo; as a shapeshifting spirit, he teaches right from wrong through his adventures while offering lessons on how to live in harmony with the natural world." Anishinaabe are Ojibway, Odawa and Algonkin Peoples who share closely related Algonquian languages. Together with other native cultures, the story of Nanaboozhoo has been handed down for centuries from generation to generation. 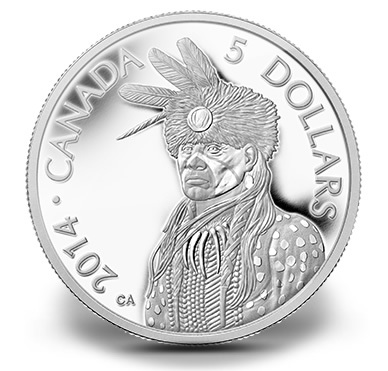 A left-facing portrait of Nanaboozhoo is featured on the reverse of the 99.95% pure platinum coin along with the inscriptions of 2014, CANADA and 5 DOLLARS. Each is composed in 1/10 ounce of the precious metal, the first single platinum coin of the size from Royal Canadian Mint. Mintage of the strike is limited to 3,000. Current pricing is shown as CAD $299.95, or US $275.89. The same basic effigy appears on a pure gold coin as featured on the platinum release. The 99.99% pure gold coins are composed of 3.14 grams of the precious metal versus the smidgen lighter platinum coin’s weight of 3.13 grams. A mintage of 3,000 also applies to this release. Pricing is listed as CAD $279.95, or US $257.50. 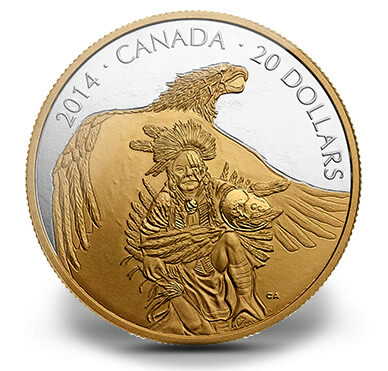 Gold plating adds to the detail on the reverse of the 2014 Nanaboozhoo and the Thunderbird 1 oz Fine Silver Coin. The mythical character is shown in the foreground with an approaching Thunderbird in the background. Each is struck from one ounce of 99.99% pure silver with the aforementioned added detail of selective gold plating. 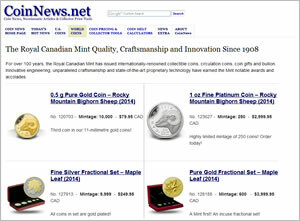 A mintage of 8,500 has been set with each selling for CAD $114.95, or US $105.73. Reverses of 2014 Legend of Nanaboozhoo 1 oz Fine Silver Coins offer colored enhancements to aid in the detail of the image. Nanaboozhoo is wearing a traditional Western Ojibwa dress as a large Thunderbird soars behind. 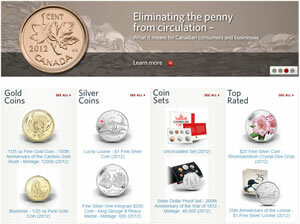 These 99.99% pure silver coins have a mintage limit of 8,500 with pricing of CAD $99.95, or US $91.93. 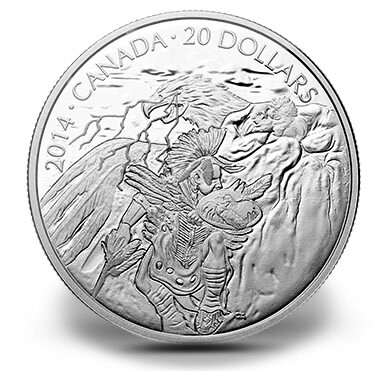 Based on traditional narratives, Nanaboozhoo is shown climbing a cliff to get to the Thunderbird’s nest on the reverse of this silver coin. After having just plucked feathers from the young birds, an angered adult readies for action. This release is composed of one ounce of 99.99% pure silver. 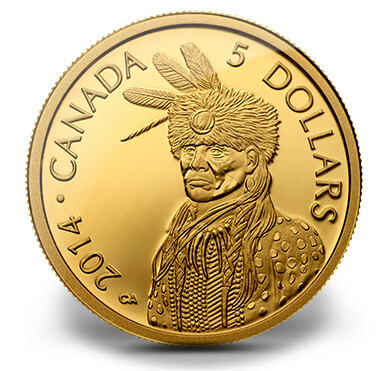 Mintage is capped at 8,500 with a price shown of CAD $89.95, or US $82.74. 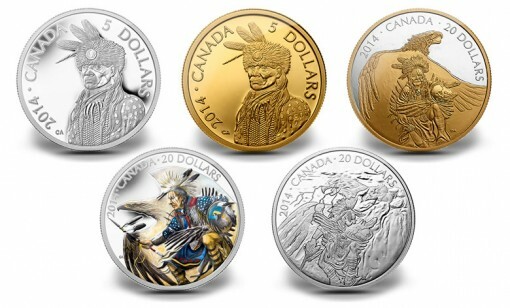 Additional details on the five Legend of Nanaboozhoo coins may be found by visiting the Royal Canadian Mint’s First Nations Coins page via the provided affiliate link.